The Lucas, NBA and Portland Trailblazers lost a member of their family over the weekend. Former Blazer great and Marquette standout Maurice Lucas passed at the age of 58 after a fight with cancer. Lucas, who spent 4 years in the ABA prior to being drafted by the Chicago Bulls of the NBA in 1974, averaged 14.6ppg and 9.1rpg during his 14-year NBA career. He was a member of the 1977 World Champion Blazers' squad and averaged 21.2ppg and 9.9rpg during the playoffs of that championship run. Lucas' style of play earned him the nickname "The Enforcer" and he was named an All-Star 4 times in the NBA and once in the ABA. Most recently he was an assistant coach from 2005 to 2009 with the Trailblazers before leaving to undergo treatment for his cancer. The passing of Lucas comes just 5 days shy of the 23rd anniversary of the Blazers retiring his #20 jersey on November 4th 1987. 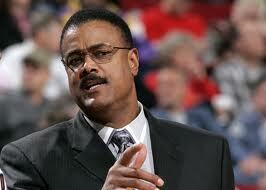 Maurice Lucas (1952-2010) will truly be missed by those who knew him. The news is rough to take in Portland as described by John Canzano in this piece.